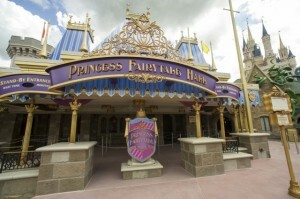 Today was a day fit for royalty of all ages as the Princess Fairytale Hall opened in the Magic Kingdom. Princess Fairytale Hall is the new home to Cinderella, Rapunzel, and other visiting princesses including Aurora, Snow White, Tiana, Jasmine, and Mulan. And of course, it’s where pint-size princesses and princes can meet and greet these members of the Disney royal court. Created in the former site of Snow White’s Scary Adventures, there’s nothing scary about this location. The façade of the hall looks like a brightly colored tournament tent with a castle-like entrance, featuring stone walls and stained glass windows that depict scenes from Cinderella. The entrance opens into a Royal Gallery with stone columns and a wooden beamed ceiling. Portraits of the Disney princesses hang on the walls. Guests visiting Princess Fairytale Hall can choose a queue for Cinderella and a visiting princess, or a queue for Rapunzel and a visiting princess. The royal chambers for the princesses feature a framed painting of a fairytale landscape and a table with storybooks of fairytales in their original language. Since the princesses have moved into this new home, they are no longer holding court for meet-and-greets at the Town Square Theater. Princess Fairytale Hall features a standby queue, but guests can also use FastPass+ and Legacy FastPass to meet the princesses.